The lightest stove option out there, and it's cheap! No messy, heavy liquid fuels. Fuel tabs come individually wrapped. What else can I say, it's the lightest! Not quite as stable as heavier stoves. Doesn't fold completely flat, but small enough. Good for boiling water, not actual cooking. At less than a half ounce, this stove is a wonder. If you are wanting to simmer food (actually cook) then this stove is not for you. If all you do is boil water to add to a pack of Mountain House, then look no further. The 0.5 ounce fuel tabs easily boil 2 cups of water with burn time to spare. 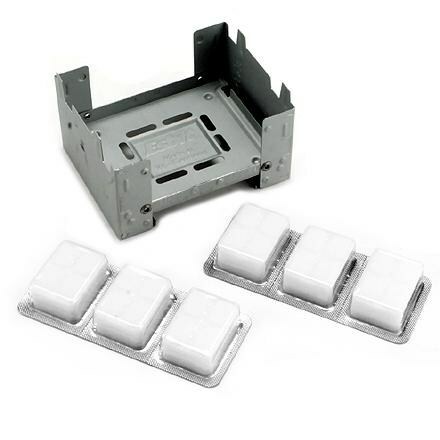 And since you don't have to worry about conserving fuel, you can light it and forget about it while you set up camp. We almost always have a fire, so I mainly use this as a backup for when it rains. It does produce an ashy residue on the bottom of my pot, but not unlike cooking over a fire. Some have voiced concerns that the fumes could possibly be harmful. I don't see how it would be much different than cooking with any other petroleum based fuel. And like I said, you don't have to hover over it. It is made from titanium, so it's very durable. It folds up to a tiny 3 inches long. And the fuel tabs are individually wrapped so you don't have to carry a fuel canister, or worry about anything leaking in your pack. This stove has really been the impetus of my ultralight renovation. Not only did it help slash the weight of my cookset, but it caused me to rethink the rest of what I'm carrying. I don't actually buy Mountain House often, but if you do, then you will probably want the long Sea to Summit spoon to reach the bottom of the bag. I prepackage most of my meals in ziplocks from anything I can just add water to and enjoy. If you put the ziplock down in your pot cozy and fold the top over the outside, it creates a nice bowl to eat from. When dinner is over you simply close up the ziplock and dishes are done! 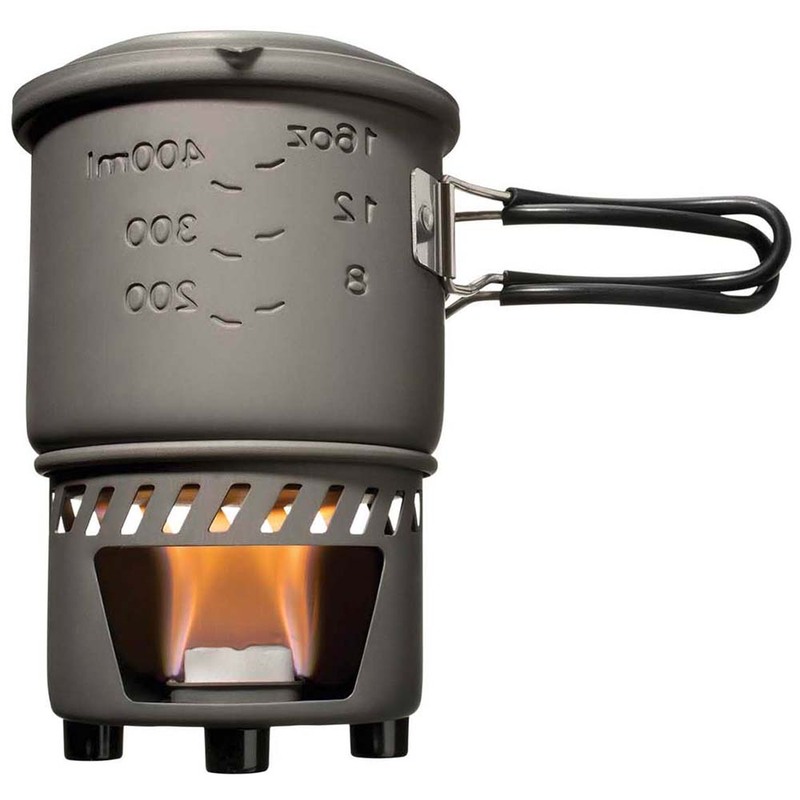 So if you hate the time and complexity of cooking, and the headache of scrubbing out pots, then "boil and eat" with this esbit stove is your best ultralight option. Super light and reliable, I use it for boiling water for freeze dried meals. At a glance I know how much fuel I've got. I take my 9-year-old son hiking. He carries a pack with his own sleeping bag and clothes. 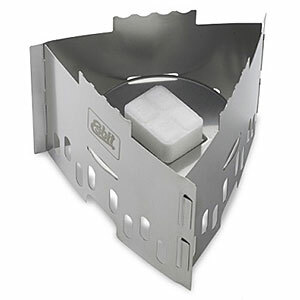 I carry the rest, so a small light and reliable stove works well for me. It is incredibly easy to set up: unfold, add fuel tab, and light. Not the fastest boil time, but I'm never in that much of a hurry. I've read other comments about the smell and mess the Esbit fuel tabs make. In my experience it seems to be a storm in a tea cup, quick clean up and there are a lot worse smells about when you've feed a 9-year-old boy freeze dried beef curry and apple pie. I've taken it away on four weekend trips. No complaints. Pick a small stable spot to set up. 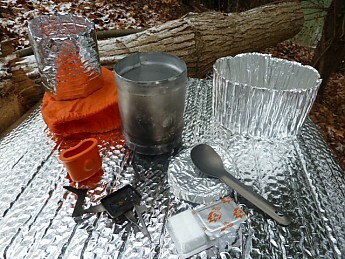 I use a DIY aluminum foil pot cosy/windscreen. Boils the 800ml of water in a reasonable time. I might time it one day. Did I mention it weighs 11 grams? Less than a fuel tab. Welcome to Trailspace, Richard. Thanks for sharing your Esbit review. Enjoy backpacking with your son! Hello Richard, I share your enthusiasm for this stove. I picked one of these up as a backup system about 6 months ago on sale for $7 (why not...it's so light and inexpensive) and have grown to like it so much that I now bring it with me on all my day trips and short overnighters. 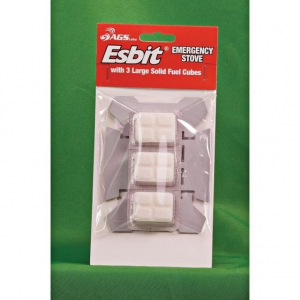 I usually use Esbit fuel tabs for their ease of carrying but I've also used an alcohol "tea light" burner with it. My boil times have been about 5.5min for 16oz of water. Happy trails! This stove rocks. It's reliable and works for me at all temps between 0 degrees and up. Also it works well from below sea level to 11,000 feet and on the snow. Hard to simmer, can be done. You must use a wind screen or wind block of some kind. Will boil 2 cups of water consistently in about 7 minutes + or - depending on conditions on about 1/2 tablet of less. This has been the only cook system I have used for 5 years now. I hike and backpack year round and this system gets taken out every trip and is well used. The fuel is easy to come by at most outdoor stores. Each tablet is .5 ounces. Carry only what you need. The fuel is safe. It does not burn as hot as alcohol. Can be put out by: blowing on it, with water. No flash fires or infernos if it should tip over. I bring this up because of the mishaps I have witnessed with alcohol stoves. Tip: Use odorless foot powder in the stuff sack to keep residue on pot from sticking to bag. This system has very little residue.To clean pot after the trip use Easy Off Oven cleaner (blue can), makes it look new for next trip. Remember it's not a race. You're just trying to boil water. Thanks for the review of your Esbit, Pig Pen! If you have any pictures to share of it in use, those would be helpful to see in your review. This is a simple way to reduce your pack volume and weight. This stove is able to fold down to the size of two of my fingers! This amazing little wonder weighs in at a mere .05 oz. !!! Using the Esbit fuel tablets this stove boils 3 cups of water in 8 min. 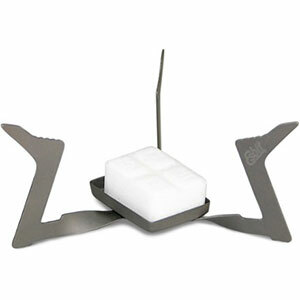 Overall I recommend this stove for the hiker wanting a small, lightweight, dependable stove for all seasons of hiking. 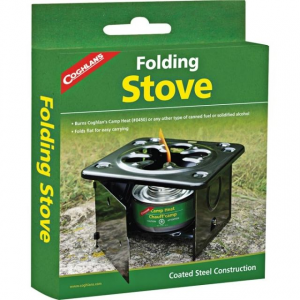 No liquids and no canisters make this stove great for keeping it green and keeping it safe.